Is Your Mental Map Outdated? Mental Maps are the guides we use to view and filter details and facts, make decisions, and disregard data unrelated to our particular context, beliefs, values and experience. We all have Mental Maps. We all use them. In fact, whether you realize or not, your’e using your map right now to decide if you’ll continue reading this (this gets explained later). The consequential nature of Mental Maps, due to everyone’s unique context (i.e. date born, age, gender, race, family of origin, culture, personality, experiences, etc. ), is that they’re partial and particular to the selected data/facts/truths we valued more important than other information. Because of this limitation which every human has, our Mental Maps can only be “good-enough” as they serve to get us where we want to go. A solid question to consider is whether or not your map is leading where you expected? Incidentally, Mental Maps tend to be invisible to us until we choose to look for them. A core task in Relational Self Discovery Therapy (RSDT) is to process them and become proficient in considering them when we’re not where we want to be. Mental Maps are handed down to us as we grow up by the various authoritative voices in our lives. The maps we are given in childhood become updated through adult interactions and solidify over time through a recursive feedback loop. This trusted map become our guide for navigating life. It is similar to the expression “what you see is all there is.” Through neuroplasticity, our brains become specialized in filtering and selecting the data that fits our preexisting maps, regardless of how well it’s serving us in the moment (the neurons that fire together—wire together). Ironically, the same Mental Maps that become our source of security also become the source of perpetual problems and relational gridlock. For example, when any two people use different maps for traversing the same territory, there will be interpersonal or intrapersonal conflict, literally or figuratively. The challenge for us, is that our Mental Maps are difficult to observe. Effective observation requires a skill called Reflective Curiosity. Reflective Curiosity is the slowing down our thinking process and becoming aware of how we formed our maps and openly sharing or writing about our map-making procedure. This approach generates new knowledge about our long-held assumptions, beliefs, values, dreams, goals, personal ethics, and the data we used to construct and design our Mental Maps. Equally important in the skill of Reflective Curiosity is the value placed in exploring the Mental Maps of others—especially those we find ourselves in opposition and conflict—often our spouses, family, friends, coworkers, and social groups. The skill of understanding Mental Maps is a high leverage and fundamental task for effective and sustainable long-term change. Developing this skill is at the core of RSDT. Although it may seem like an intellectual exercise, it is one of the most practical things we can do. It directly affects our ability to successfully navigate the naturally changing landscape of our lives. 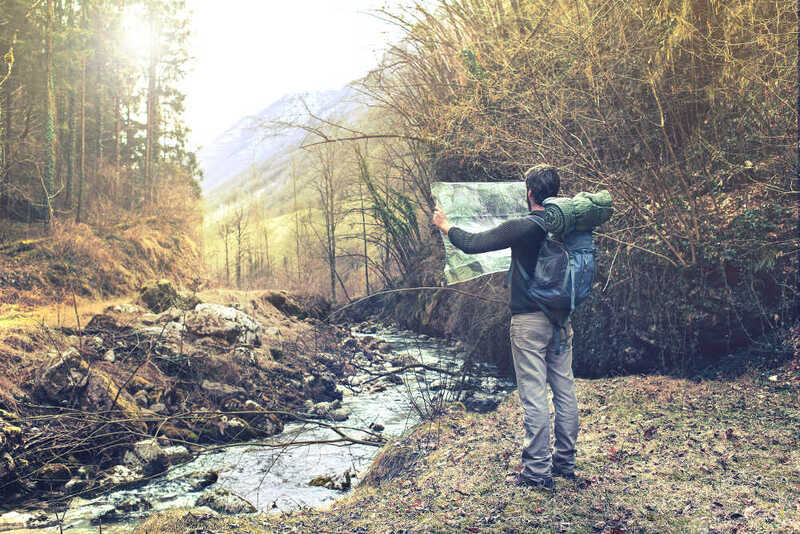 Unfortunately, updating our Mental Maps can be difficult, long used maps can become like cherished heirlooms of times-past and family traditions. They create a sense of familiarity and continuity. Many people become stuck using ineffective but “familiar” Mental Maps. Even when what’s familiar is the increasing pain of walking in circles and running into obstacles, it’s still more appealing than the anxiety of a new map and uncharted territory. The grip to long held Mental Maps can make it difficult to consider the possibility that unexamined maps are just as likely to lead you off of cliff as they are to lead you home. When we begin to practice the skill of examining our Mental Maps, we bring to the surface some of the unconscious and automatic responses to people, situations, and events. We will see, perhaps for the first time, how we have responded with incomplete or automatic thinking. Have you ever examined you Mental Map? If so, when was the last time you examined it? Don’t let an outdated map lead you in the wrong direction. Unexamined Mental Maps consist of the beliefs and conclusions inferred from what we observed today, how it relates to our experience, and how it fits into the maps we inherited. Our ability to achieve an updated and congruent Mental Map gets eroded by our belief that the current map, although not serving us well, is aligned with “obvious” truth. For example, if our Mental Map has a negativity bias—which as a function of our biology for survival, likely does—there will be a tendency for our brain to become specialized in recognizing and amplifying hostility while ignoring the positive and harmonious. Every crack of a twig or shadowy figure in the distance becomes the triggering observation for the fight/flight response and the its cascade of stress hormones. Old or inherited Mental Maps are not necessarily wrong, many people’s work quite well, regardless of their functionality, they're simply not the whole story, the map is never the territory. Even if your map is the best in the world, when faced with relational conflict, how will you convince someone to consider following your map (opinions/beliefs/dreams), if you can’t tell them where it comes from or how it was developed? Please take a moment to examine the ladder. Does social media, our current political climate, and your cut-off relationships make more sense? Consider The Ladder of Inference as a way to describe the way we use our Mental Maps. Our initial maps, build on data from long ago, can keep us from considering new information that doesn't fit our current map. This is why intimate relationships can be so difficult. What we see is all there is. It’s the same way with social media. Social media algorithms predict what we like (our maps) and tend to reinforce the outdated usefulness of past preferences. This automated recursion also helps explain the current political and culture divides across the globe. If all I can see is the data that reinforces my existing and likely outdated map, growth, development, and relationships become difficult. Reflective Curiosity, as mentioned earlier, is the much needed ability to walk ourselves back down the ladder to see how our Mental Maps have formed and see how a change could help us reach our desired destination. The Ladder of Inference also illustrates why many people have difficulty recalling where their deep beliefs, core values, dreams, and personal ethics come from. Starting from the top, we can step down The Ladder of Inference, one rung at a time, to guide the discovery of our Mental Maps. This process helps us to make our thinking, logic, core values, dreams, and “map building” visible to ourselves and to others. We become more authentic and so does our communication. What beliefs do I have that encourage those particular actions versus other ones? What conclusions have I made? What assumptions (things “I know” but don’t have independently verifiable data to back them up) that led to those conclusions? What’s the source of the data I’ve selected to use? What additional data could I observe and consider? Talking with other people about our Mental Maps also creates space for the dueling needs of autonomy and connection through increased mutual understanding. Even if other people disagree with our beliefs/values/opinions, the conclusions we derive from stepping down the ladder, there is usually a deeper sense of connection and camaraderie through the process itself. For example, although others may disagree with us, they can see the data, values, and dreams which formed our map. It paints the backdrop for our particular context in a unique and interesting narrative. This is a great way for becoming allies rather than adversaries. It helps us move from beyond perpetual problems and gridlock to increased fondness and admiration for one another. It even helps our maps align. If we focus on advocating for our Mental Maps (old ones or new ones!) we aren’t demonstrating the Reflective Curiosity needed to connect to others. If we focus more on inquiring about other’s Mental Maps, we’ll find ourselves not knowing our values and beliefs and lacking a strong personal identity. Fundamentally, we lay out our reasoning and then encourage others to ask about our Mental Maps. Share your assumptions and the values, dreams, information, and experiences that led to them. Ask others to make their thinking process visible. Check for understanding. Explore, and listen. Be a curious learner. Check with them to see if you have it right. If you do, then you can share your ideas and your Mental Map. If not, ask for clarity on the missed points. Check, again. If you get stuck, you can ask: “what do we both know to be true?” “What do we actually disagree on?” Answer as clearly and with as much precision as possible. We all have mental maps. If we can learn how to identify and update them as necessary, we will develop a deeper and stronger sense of self while increasing our ability to get along with others in a meaningful way. You can be connected while being yourself. Gottman, J. M., & Gottman, J. S. (2006). Ten lessons to transform your marriage: Americas love lab experts share their strategies for strengthening your relationship. New York: Three Rivers Press. Kahneman, D. (2015). Thinking, fast and slow. New York: Farrar, Straus and Giroux. Schnarch, D. M. (2018). Brain talk: How mind mapping brain science can change your life & everyone in it. Evergreen, CO: Sterling.